It was another wonderful morning in Sugarbush Valley. 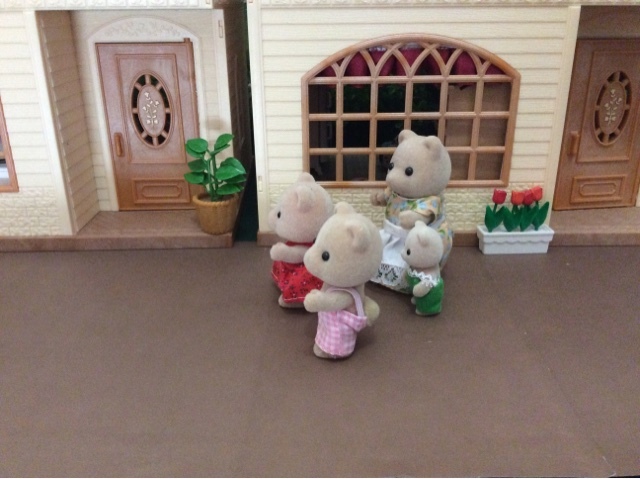 This was the thoughts of Tamsie Honeybear as she accompanied her three children to school. 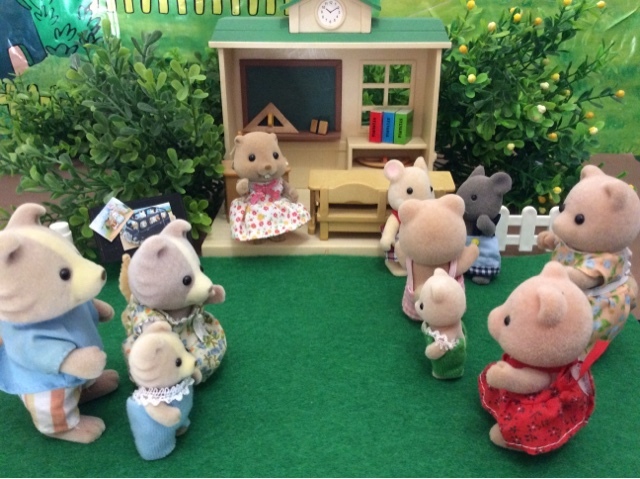 As they arrived at school, Tamsie's son Diggory immediately spotted tow of his classmates, Geo Hawton and Lester Thistlethorn. "Heya Digg!" Geo greeted excitedly. "Ready for the big game this afternoon?" Lester asked. Meanwhile Katy spotted her friend Abigail Woodbrook. "Bye mommy!" she yelled and joined her friend. 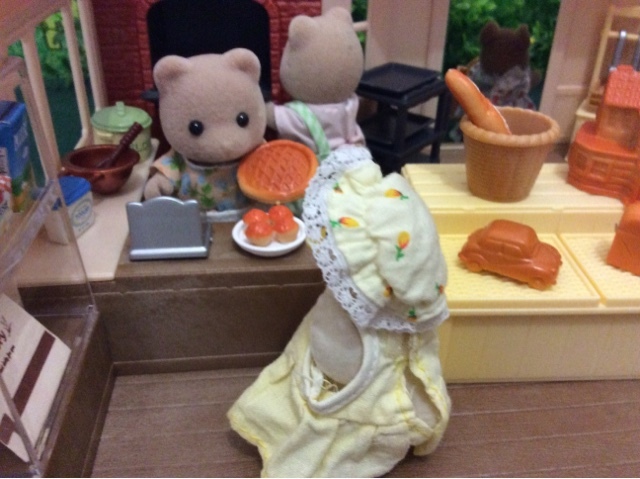 "Good morning, Katy!" Abigail greeted perfectly. "You look wonderful this morning." Tamsie just smiled. It was always so interesting, how boys and girls differ. Tamsie's thoughts were interupted by Harley Farthing, "Good morning Tamsie, what another spectacular day in Sugarbush!" Tamsie smiled, "Indeed, I noticed it too while we were walking to school this." "Well you must enjoy your day, happy baking!" Harley smiled. "Oh and can I take Lumy to school with Rally? 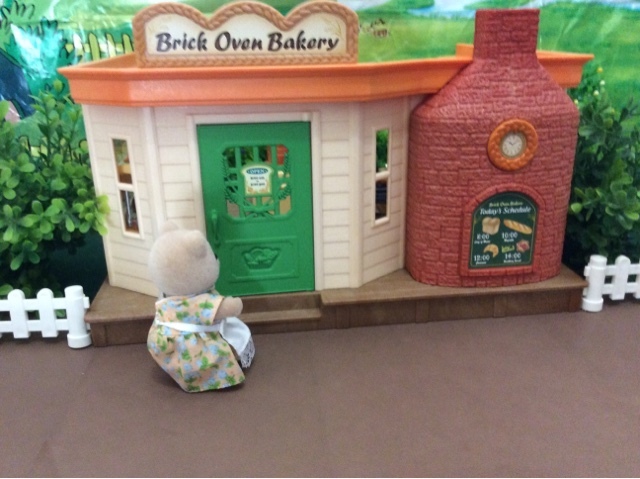 I know you must open the bakery soon, and I don't mind to?" Lumy answered the request for her mother, "Yes I want to, mommy!" Lumy cried. Tamsie kissed her youngest and waved them off. Though opening times wasn't that strict in Sugarbush, Tamsie was greatful to for once not be late. She unlocked the bakery and changed the "closed" sign to "open". 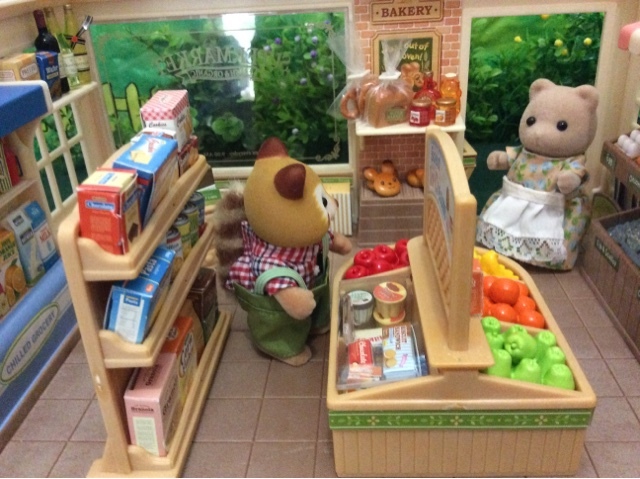 Like every other morning Tamsie was quite surprised by the emptiness of the shelves. They days are usually so busy that she doesn't always realise how fast the baked goods sell out. They were truly blessed, because empty shelves was a sign of good business. Tamsie immediately start of by mixing the dough for the baguettes, they are by far the best sellers, and she usually has to bake more than one batch a day. As expected, just as she took them out of the oven the first customers arrived. This morning it was PC Roberts and his son, Hughie. "Good morning, Tamsie. Ooh, I guess you just took these out, they smell delicious. 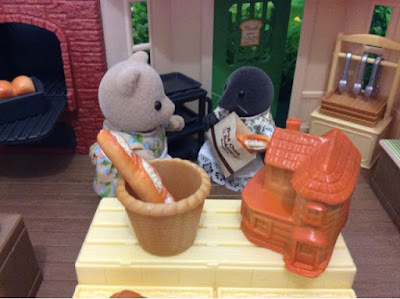 Unfortunately, I'm not here to buy bread, I forgot to buy some snacks for Hughie's school lunch, and as you are on the way, I thought I'd treat him with something special." 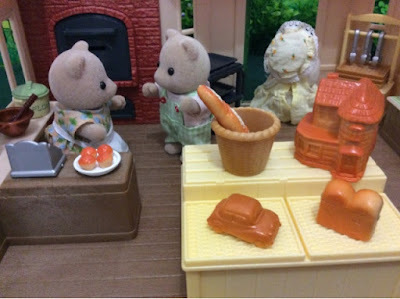 "That is a fabulous idea, we have many baked treats for the kids, that is not too sugary or filled with jam or cream." Tamsie explained. "Of course. Hughie, where are you, come here! What are you doing behind the counter, show me what you would like." Bobby called out to Hughie. While father and son made up their minds, Tamsie attended to Heidi Mcburrows. "Morning Heidi, fresh baguette, I guess?" The shy mole giggled, "Yes please, Tamsie!" 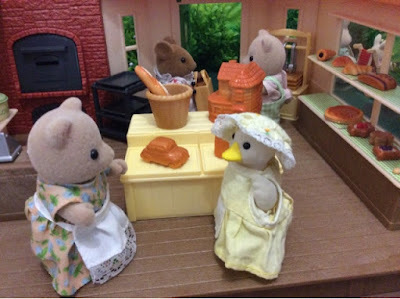 Tamsie, however first assisted the Roberts' out of the bakery. 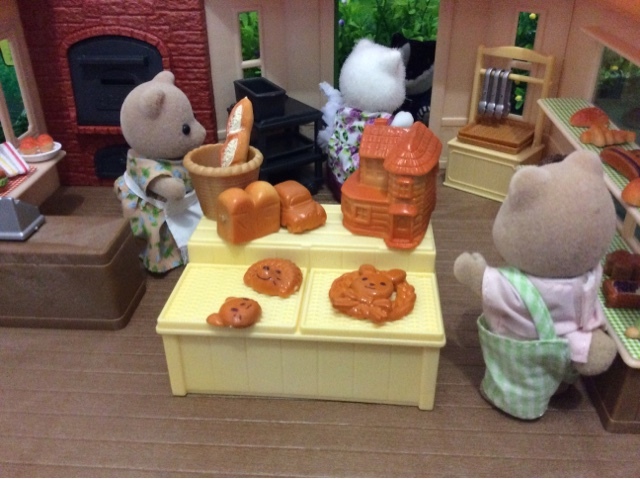 "That fish shape bread is a great choice, it is filled with a delicious tuna surprise. I'm sure Hughie will like it." Tamsie waved goodbye. Finally Tamsie could wrap Heidi's baguette and after a quick chat, Heidi excused herself. 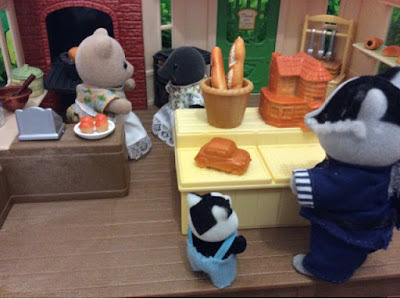 Tamsie was glad to be alone again, she has to get the Honeybread in the oven, it is Friday and Friday's are Honeybread day. 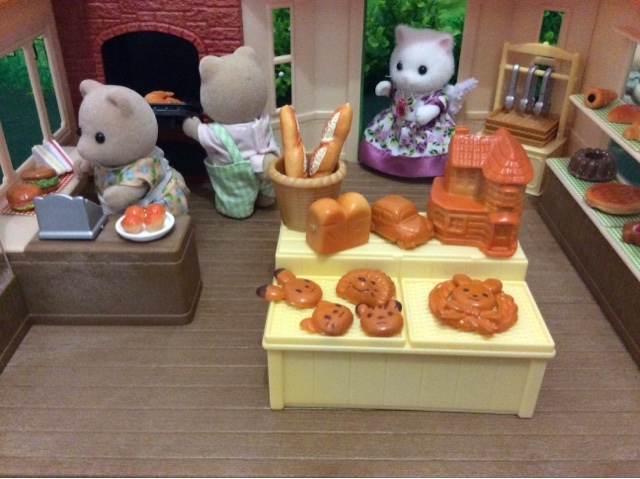 The Honeybread is her specialty, and though it is easy and quick to make, it is exclusive and only available on Friday's. 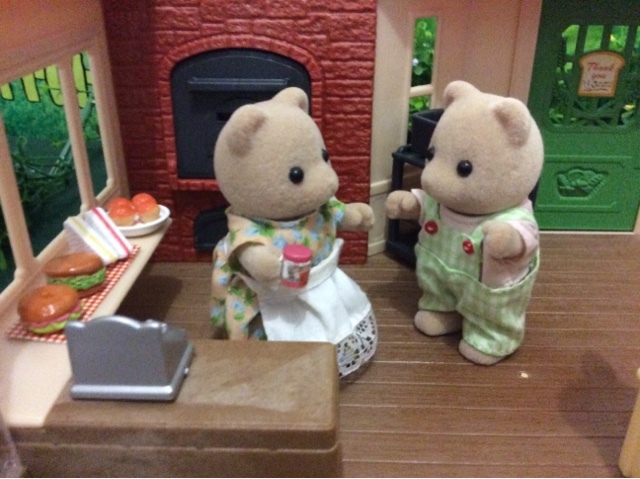 Tamsie hymned softly and was about to pour the honey into the mixture, when she realised that the jar was gone. She was sure she had it before the first customers arrived. Tamsie looked under her bench, and even went to the small shelf were they keep some bread spreads for sale, but it wasn't there either. 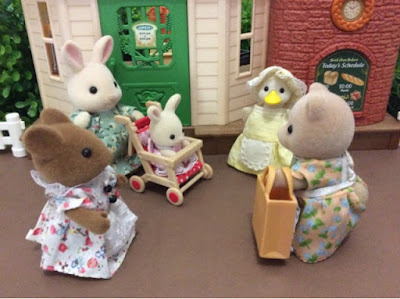 "Oh no, now I must rush over to the Supermarket. The Bearbury's just live to far out, I will never be back in time!" she thought out loud. Tamsie was relieved to see that the Supermarket was empty. She grabbed a bottle from the shelf, barely greeted Wilbur Redwood, and rushed to the till. 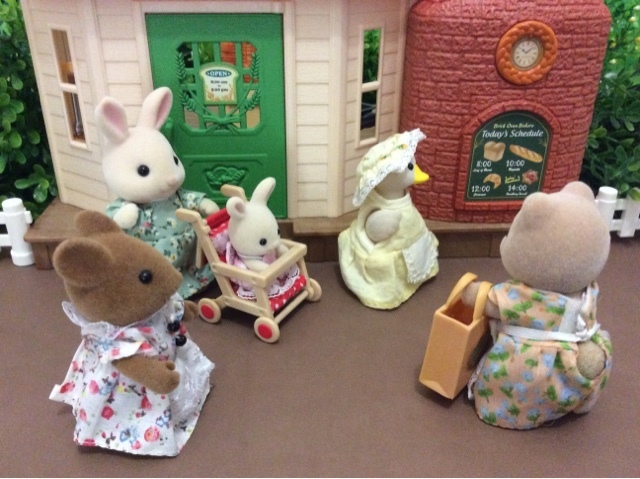 "Tamsie, you look in an awful hurry?" Wilbur inquired. 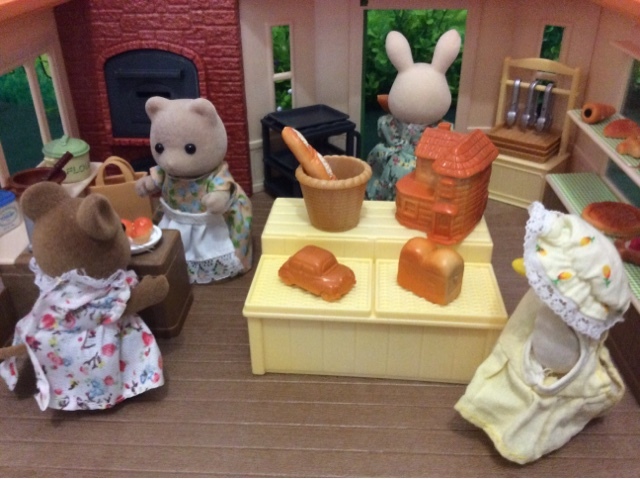 "I am, sorry for my rudeness, but my Honeybread is not in the oven yet, and the customers will soon start to arrive and demand it!" Tamsie explained wide eyed. 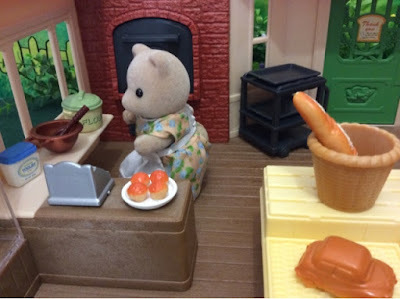 "Hmmm, the Honeybread. I get it, here is your change, go Tamsie and good luck!" "Tamsie Honeybear! 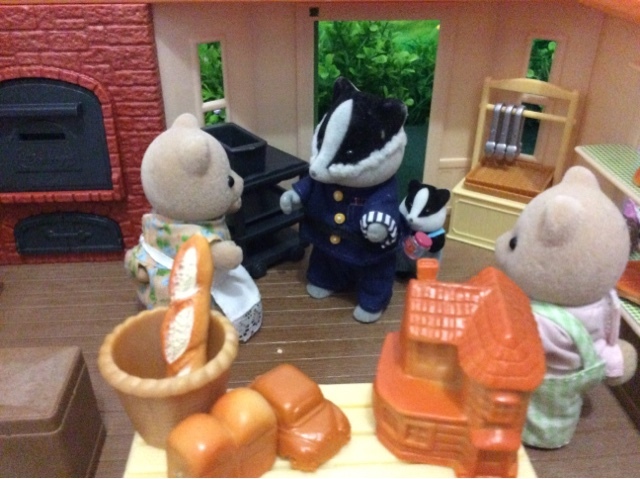 Why on earth are you buying honey at the Supermarket." The upset voice came from Irene Bearbury, whose husband was the official supplier of honey to the Bakery. 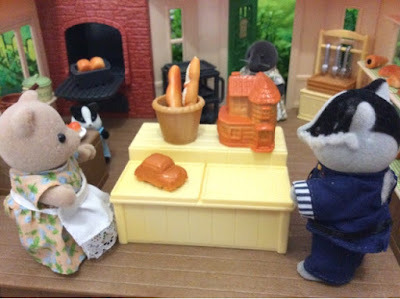 Tamsie quickly explained to Irene her dilemma, and after hearing the story, even Irene encouraged her to run like the wind, and get the bread in the oven. Tamsie's heart sank when she reached the bakery, as there were already three customers waiting. 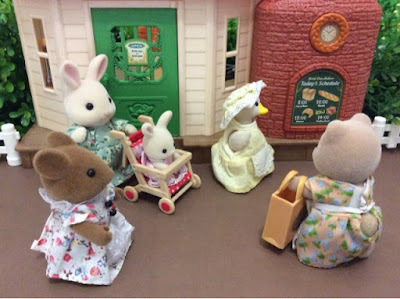 "Good morning, ladies. Sorry you had to wait, I'm having a small crises." Tamsie tried to explain. "It is ok." Blanka Buttermilk replied. "Yes, no worries at all." Betty Hazelwood agreed. But Tamsie could sense that Beth Puddleford didn't approve. "No Tamsie, this is unacceptable, your sign say you open at 8:00, it is already 10 'o clock, why aren't you open. Remember a lack of planning on your side does not constitute an emergency on my part." Beth preach. 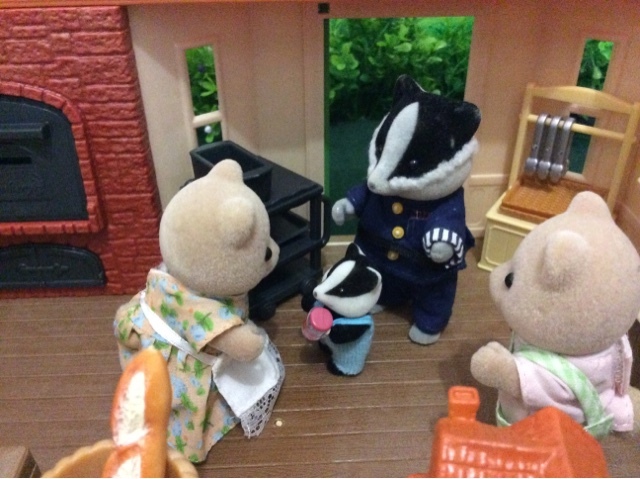 Tamsie just sighed, apologised and unlock the door, she knew there was no sense in arguing with Beth. 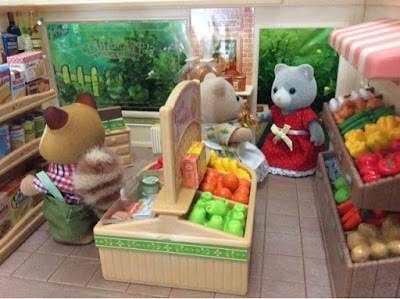 "At least the shelves are not empty, otherwise I would've surely went to Blueberry Hill to do my shopping." Beth mumbled. Blanka looked at Tamsie and winked. 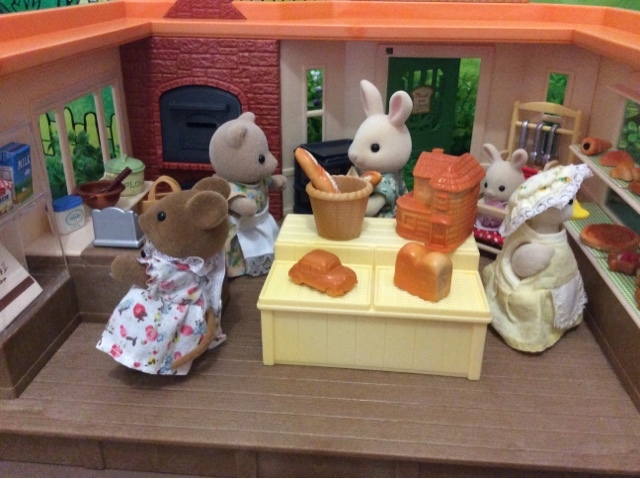 "Everything looks delicious, but for now just some bunnies for me, please." 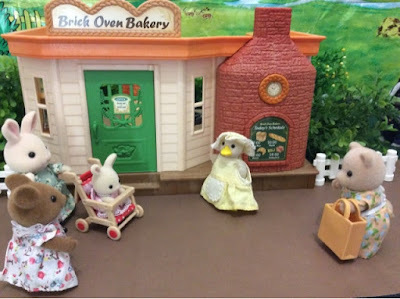 Blanka thanked Tamsie, wished her a good day and left the bakery. Tamsie knew, Betty was there to pick up The Home's daily order, she quickly packed that and with more thank you's Betty was on her way too. Tamsie took a deep breath and approached Beth, "Anything in particular you are looking for, Beth?" Tamsie inquired sweetly? "I want to treat Nelson with something special at lunch, but I don't see anything I think he would like?" Beth replied. 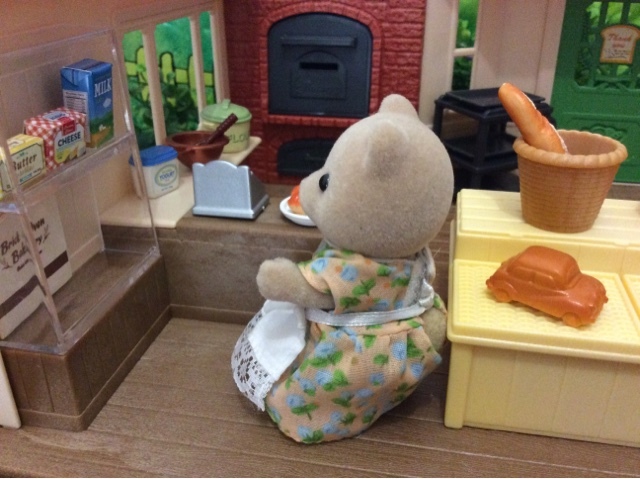 "Are you looking for something sweet or savoury?" Tamsie asked. Finally Beth settled on a plum tart for dessert. Tamsie was relieved that she found something that pleased the ever difficult Beth. As Beth left, Bertie approached her, "Honey, where is the Honeybread?" he asked. 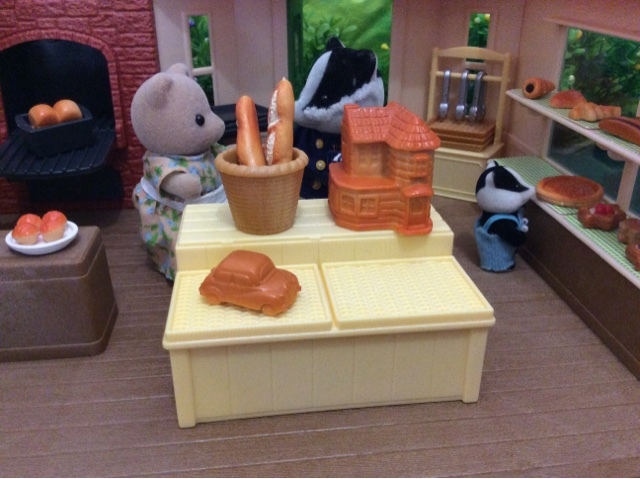 Tamsie quickly told Bertie about the missing honey. Bertie was as dumbfounded, but they agreed that there was no sense in wasting time about trying to solve the mystery. 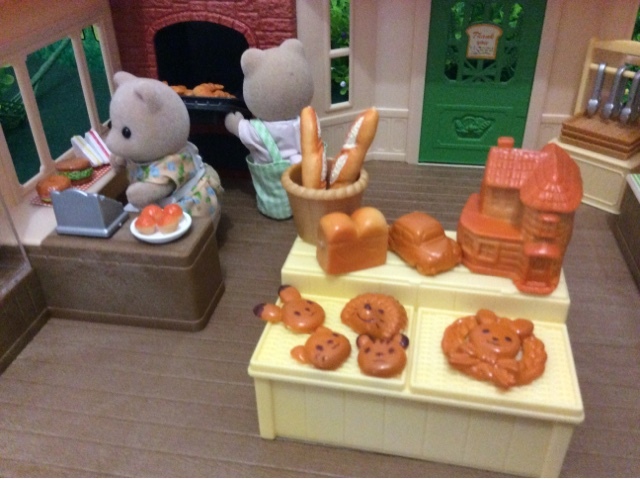 The two of them started working, and soon the shelves were filled. 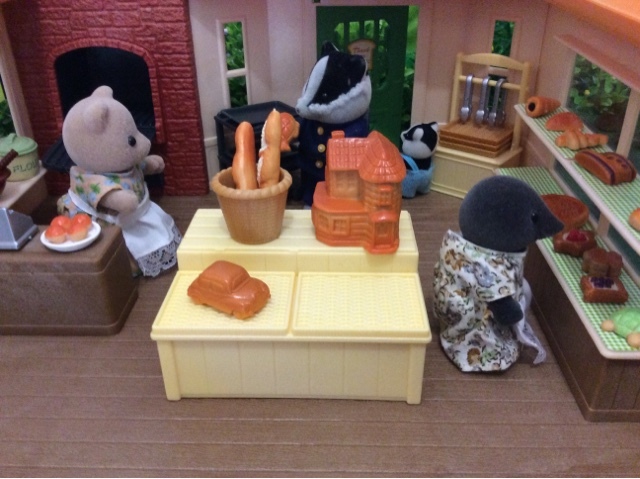 Tamsie managed to prep some sandwiches, ready to be taken away for those in a hurry, and Bertie finally shoved the croissants into the oven. Just then the door opened and Tamsie realised that they haven't had any customers for over and hour. This time it was Cecilia Teak. 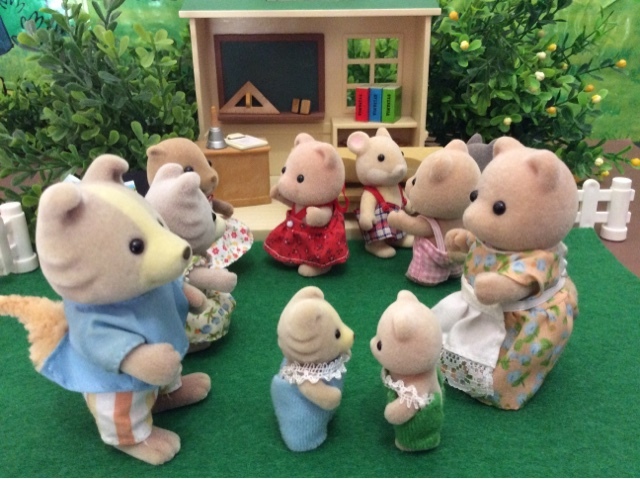 "Good morning, Cecilia. Good to see you out and about. How can we help you?" Tamsie greeted. Tamsie helped Cecilia pick a few special items, Cecilia paid, thanked the Honeybears for their great help and was off. "Oh she seems happy today?" Tamsie remarked. "She does, indeed!" Bertie agreed. Just then they noticed another customer, "PC Roberts? Something the matter, I really hope that Hughie didn't get an allergic reaction to the tuna bread?" Tamsie asked wide eyed. PC Roberts looked furious, "No Tamsie, it is much worse than that, come on Hughie, don't be shy now!" As Hughie stepped around his dad, Tamsie noticed the missing honey jar in Hughie's small hands. "Oh my!" she gasped. 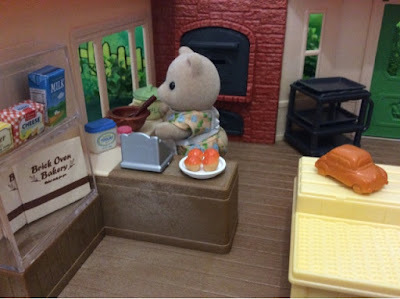 So that is what happened to my honey, Tamsie thought to herself. 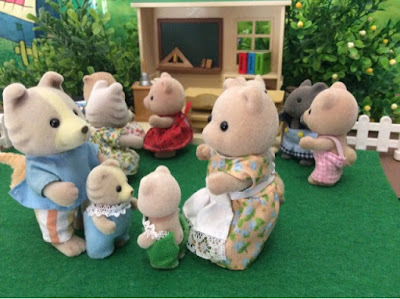 "Auntie Tamsie, I'm so sorry, I took your honey. I love honey, but that is not a reason to take something that doesn't belong to me. I know I should've paid for it." 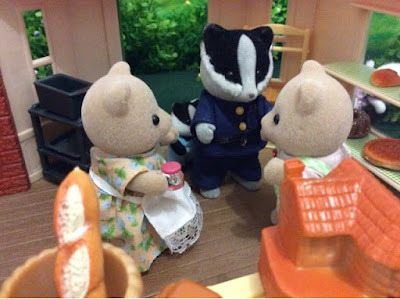 Tamsie stifled a grin, the irony wasn't lost on her, but she realised it was a very serious situation for PC Bobby, so she tried her best to handle it as a serious one. "Yes that was wrong, Hughie, but you did the right thing to bring it back to me and apologise, I appreciate that, thank you!" 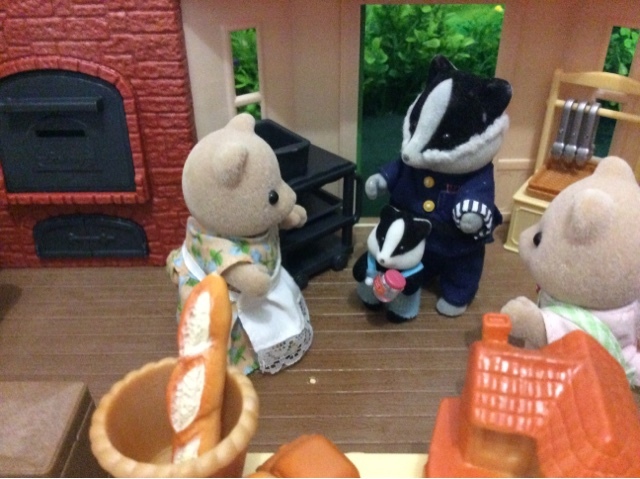 After returning the jar to Tamsie, Hughie quickly hid behind his dad. "I am really so sorry Tamsie, Bertie. It is indeed very ironic that the son of the Police Constable are a little thief, but trust me he will not do it again." Bobby explained. "Don't worry, Constable," Bertie said, "we understand." Glad that they mystery of the disappearing honey was solved, Tamsie and Bertie took a minute to process the day. It has been exhausting but fun day so far, but as the doorknob turned they realised that it is not over yet. Delightful story! I had to go back and really saw that the honey jar was missing after Hughie left! Naughty boy but lets hope he got his lesson! How frustrating for his dad! I had a giggle with Beth's snob behavior too! Hahaha! The things kids do! I love how true to life your stories are, including the "interesting" residents! Thanks Chill, I always try to keep it real! Bobby handled it well, he is strict but fair. I surprised myself with Beth too, I always thought she was not as bad as her husband! What a delightful story! 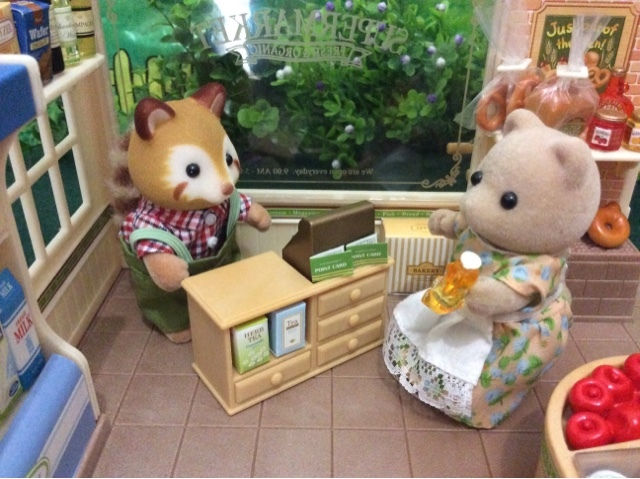 I went through your story again and I spotted Hughie hiding behind the counter in one of the pictures It must be when he took the honey jar. 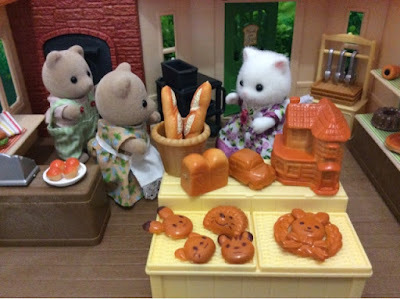 How funny :) I also loved to see the bakery again. It´s a lovely building. It looks fantastic next to the fences you put at both sides and the inside it´s really nice, very spacious and inviting with so many nice treats to choose from. Thanks for the wonderful comment Cutata. 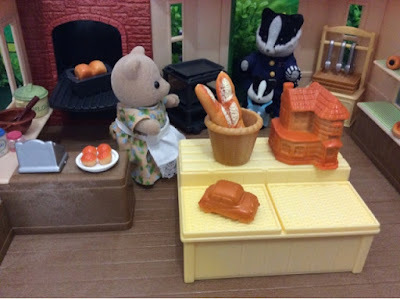 Im really enjoying the bakery as well, it is not comparable with the Watermill bakery I guess, but it is wonderful! Thank you! Aw little Hughie?! I would never have guessed. Good for him doing the right thing in the end and fortunate that it wasn't Beth that he stole from- lol! 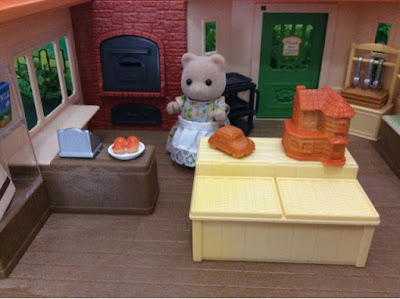 I think it was an honest mistake, but yes Beth might have been very unhappy if it was form her!